So I’m going to have a third Reading the Comics essay for last week’s strips. This happens sometimes. Two of the four strips for this essay mention percentages. But one of the others is so important to me that it gets naming rights for the essay. You’ll understand when I’m done. I hope. Angie Bailey’s Texts From Mittens for the 2nd talks about percentages. That’s a corner of arithmetic that many people find frightening and unwelcoming. I’m tickled that Mittens doesn’t understand how easy it is to work out a percentage of 100. It’s a good, reasonable bit of characterization for a cat. Angie Bailey’s Texts From Mittens for the 2nd of August, 2018. Before you ask whether this is really a comic strip, given that it’s all just text: well, Graffiti is a comic strip, isn’t it? I guess? Anyway it’s running on GoComics.com so it’s easy enough for me to read. John Graziano’s Ripley’s Believe It Or Not for the 2nd is about a subject close to my heart. At least a third of it is. The mention of negative Kelvin temperatures set off a … heated … debate on the comments thread at GoComics.com. Quite a few people remember learning in school that the Kelvin temperature scale. It starts with the coldest possible temperature, which is zero. And that’s that. They have taken this to denounce Graziano as writing obvious nonsense. Well. Something you should know about anything you learned in school: the reality is more complicated than that. This is true for thermodynamics. This is true for mathematics. This is true for anything interesting enough for humans to study. This also applies to stuff you learned as an undergraduate. Also to grad school. John Graziano’s Ripley’s Believe It Or Not for the 2nd of August, 2018. … Why did the Madrid police train a dog to demonstrate CPR? I mean, it’s cute, and I guess it gets some publicity for emergency-health-care techniques but is it useful? For the time and effort invested? It seems peculiar to me. So what are negative temperatures? At least on an absolute temperature scale, where the answer isn’t an obvious and boring “cold”? One clue is in the word “absolute” there. It means a way of measuring temperature that’s in some way independent of how we do the measurement. In ordinary life we measure temperatures with physical phenomena. Fluids that expand or contract as their temperature changes. Metals that expand or contract as their temperatures change. For special cases like blast furnaces, sample slugs of clays that harden or don’t at temperature. Observing the radiation of light off a thing. And these are all fine, useful in their domains. They’re also bound in particular physical experiments, though. Is there a definition of temperature that … you know … we can do mathematically? Of course, or I wouldn’t be writing this. There are two mathematical-physics components to give us temperature. One is the internal energy of your system. This is the energy of whatever your thing is, less the gravitational or potential energy that reflects where it happens to be sitting. Also minus the kinetic energy that comes of the whole system moving in whatever way you like. That is, the energy you’d see if that thing were in an otherwise empty universe. The second part is — OK, this will confuse people. It’s the entropy. Which is not a word for “stuff gets broken”. Not in this context. The entropy of a system describes how many distinct ways there are for a system to arrange its energy. Low-entropy systems have only a few ways to put things. High-entropy systems have a lot of ways to put things. This does harmonize with the pop-culture idea of entropy. There are many ways for a room to be messy. There are few ways for it to be clean. And it’s so easy to make a room messier and hard to make it tidier. We say entropy tends to increase. This definition sounds bizarre. But it works brilliantly. It’s all nice clean mathematics. It matches perfectly nice easy-to-work-out cases, too. Like, you may kind of remember from high school physics how the temperature of a gas is something something average kinetic energy something. Work out the entropy and the internal energy of an ideal gas. Guess what this change-in-entropy/change-in-internal-energy thing gives you? Exactly something something average kinetic energy something. It’s brilliant. In ordinary stuff, adding a little more internal energy to a system opens up new ways to arrange that energy. It always increases the entropy. So the absolute temperature, from this definition, is always positive. Good stuff. Matches our intuition well. So in 1956 Dr Norman Ramsey and Dr Martin Klein published some interesting papers in the Physical Review. (Here’s a link to Ramsey’s paper and here’s Klein’s, if you can get someone else to pay for your access.) Their insightful question: what happens if a physical system has a maximum internal energy? If there’s some way of arranging the things in your system so that no more energy can come in? What if you’re close to but not at that maximum? It depends on details, yes. But consider this setup: there’s one, or only a handful, of ways to arrange the maximum possible internal energy. There’s some more ways to arrange nearly-the-maximum-possible internal energy. There’s even more ways to arrange not-quite-nearly-the-maximum-possible internal energy. Look at what that implies, though. If you’re near the maximum-possible internal energy, then adding a tiny bit of energy reduces the entropy. There’s fewer ways to arrange that greater bit of energy. Greater internal energy, reduced entropy. This implies the temperature is negative. So we have to allow the idea of negative temperatures. Or we have to throw out this statistical-mechanics-based definition of temperature. And the definition works so well otherwise. Nobody’s got an idea nearly as good for it. So mathematical physicists shrugged, and noted this as a possibility, but mostly ignored it for decades. If it got mentioned, it was because the instructor was showing off a neat weird thing. This is how I encountered it, as a young physics major full of confidence and not at all good on wedge products. But it was sitting right there, in my textbook, Kittel and Kroemer’s Thermal Physics . Appendix E, four brisk pages before the index. Still, it was an enchanting piece. And a useful one, possibly the most useful four-page aside I encountered as an undergraduate. My thesis research simulated a fluid-equilibrium problem run at different temperatures. There was a natural way that this fluid would have a maximum possible internal energy. So, a good part — the most fascinating part — of my research was in the world of negative temperatures. It’s a strange one, one where entropy seems to work in reverse. Things build, spontaneously. More heat, more energy, makes them build faster. In simulation, a shell of viscosity-free gas turned into what looked for all the world like a solid shell. All right, but you can simulate anything on a computer, or in equations, as I did. Would this ever happen in reality? … And yes, in some ways. Internal energy and entropy are ideas that have natural, irresistible fits in information theory. This is the study of … information. I mean, how you send a signal and how you receive a signal. It turns out a lot of laser physics has, in information theory terms, behavior that’s negative-temperature. And, all right, but that’s not what anybody thinks of as temperature. Well, these ideas happen still. They usually need some kind of special constraint on the things. Atoms held in a magnetic field so that their motions are constrained. Vortices locked into place on a two-dimensional surface (a prerequisite to my little fluids problems). Atoms bound into a lattice that keeps them from being able to fly free. All weird stuff, yes. But all exactly as the statistical-mechanics temperature idea calls on. And notice. These negative temperatures happen only when the energy is extremely high. This is the grounds for saying that they’re hotter than positive temperatures. And good reason, too. Getting into what heat is, as opposed to temperature, is an even longer discussion. But it seems fair to say something with a huge internal energy has more heat than something with slight internal energy. So Graziano’s Ripley’s claim is right. If you’re interested in more about this, I recommend Stephen J Blundell and Katherine M Blundell’s Concepts in Thermal Physics . Even if you’re not comfortable enough in calculus to follow the derivations, the textbook prose is insightful. John Hambrock’s The Brilliant Mind of Edison Lee for the 3rd of August, 2018. I’m sorry, I can’t remember who the other kid’s name is, but Edison Lee is always doing this sort of thing with him. John Hambrock’s The Brilliant Mind of Edison Lee for the 3rd is a probability joke. And it’s built on how impossible putting together a particular huge complicated structure can be. I admit I’m not sure how I’d go about calculating the chance of a heap of Legos producing a giraffe shape. Imagine working out the number of ways Legos might fall together. Imagine working out how many of those could be called giraffe shapes. It seems too great a workload. And figuring it by experiment, shuffling Legos until a giraffe pops out, doesn’t seem much better. This approaches an argument sometimes raised about the origins of life. Grant there’s no chance that a pile of Legos could be dropped together to make a giraffe shape. How can the much bigger pile of chemical elements have been stirred together to make an actual giraffe? Or, the same problem in another guise. If a monkey could go at a typewriter forever without typing any of Shakespeare’s plays, how did a chain of monkeys get to writing all of them? And there’s a couple of explanations. At least partial explanations. There is much we don’t understand about the origins of life. But one is that the universe is huge. There’s lots of stars. It looks like most stars have planets. There’s lots of chances for chemicals to mix together and form a biochemistry. Even an impossibly unlikely thing will happen, given enough chances. And another part is selection. A pile of Legos thrown into a pile can do pretty much anything. Any piece will fit into any other piece in a variety of ways. A pile of chemicals are more constrained in what they can do. Hydrogen, oxygen, and a bit of activation energy can make hydrogen-plus-hydroxide ions, water, or hydrogen peroxide, and that’s it. There can be a lot of ways to arrange things. Proteins are chains of amino acids. These chains can be about as long as you like. (It seems.) (I suppose there must be some limit.) And they curl over and fold up in some of the most complicated mathematical problems anyone can even imagine doing. How hard is it to find a set of chemicals that are a biochemistry? … That’s hard to say. There are about twenty amino acids used for proteins in our life. It seems like there could be a plausible life with eighteen amino acids, or 24, including a couple we don’t use here. It seems plausible, though, that my father could have had two brothers growing up; if there were, would I exist? Jason Chatfield’s Ginger Meggs for the 3rd of August, 2018. This doesn’t relate to the particular comic any. Wikipedia says that in January 2017 they launched a special version of the strip, designed for people to read on mobile phones, where the panels progress vertically so you just scroll down to read them. This tickles the part of me that was fascinated how pre-Leap-Day-1988 Peanuts strips could be arranged as one row of four panels, two rows of two panels, or four rows of one panel to fit a newspaper’s needs. I’m not mocking the idea. I’d love it if comic strips could be usefully read on mobile devices. I can’t imagine my Reading the Comics workflow working with one, though. Jason Chatfield’s Ginger Meggs for the 3rd is a story-problem joke. Familiar old form to one. The question seems to be a bit mangled in the asking, though. Thirty percent of Jonson’s twelve apples is a nasty fractional number of apples. Surely the question should have given Jonson ten and Fitzclown twelve apples. Then thirty percent of Jonson’s apples would be a nice whole number. I talk about mathematics themes in comic strips often, and those essays are gathered at this link. You might enjoy more of them. If Texts From Mittens gets on-topic for me again I’ll have an essay about it at this link.. (It’s a new tag, and a new comic, at least at GoComics.com.) Other discussions of Ripley’s Believe It Or Not strips are at this link and probably aren’t all mentions of Rubik’s Cubes. The Brilliant Mind of Edison Lee appears in essays at this link. And other appearances of Ginger Meggs are at this link. And so yeah, that one Star Trek: The Next Generation episode where they say the surface temperature is like negative 300 degrees Celsius, and therefore below absolute zero? I’m willing to write that off as it’s an incredibly high-energy atmosphere that’s fallen into negative (absolute) temperatures. Makes the place more exotic and weird. They need more of that. I’m working on the next Why Stuff Can Orbit post, this one to feature a special little surprise. In the meanwhile here’s some of the things I’ve read recently and liked. The Theorem of the Day is just what the name offers. They’re fit onto single slides, so there’s not much text to read. I’ll grant some of them might be hard reading at once, though, if you’re not familiar with the lingo. Anyway, this particular theorem, the Lindemann-Weierstrass Theorem, is one of the famous ones. Also one of the best-named ones. Karl Weierstrass is one of those names you find all over analysis. Over the latter half of the 19th century he attacked the logical problems that had bugged calculus for the previous three centuries and beat them all. I’m lying, but not by much. Ferdinand von Lindemann’s name turns up less often, but he’s known in mathematics circles for proving that π is transcendental (and so, ultimately, that the circle can’t be squared by compass and straightedge). And he was David Hilbert’s thesis advisor. The Lindemann-Weierstrass Theorem is one of those little utility theorems that’s neat on its own, yes, but is good for proving other stuff. This theorem says that if a given number is algebraic (ask about that some A To Z series) then e raised to that number has to be transcendental, and vice-versa. (The exception: e raised to 0 is equal to 1.) The page also mentions one of those fun things you run across when you have a scientific calculator and can repeat an operation on whatever the result of the last operation was. I’ve mentioned Maths By A Girl before, but, it’s worth checking in again. This is a piece about Apéry’s Constant, which is one of those numbers mathematicians have heard of, and that we don’t know whether is transcendental or not. It’s hard proving numbers are transcendental. If you go out trying to build a transcendental number it’s easy, but otherwise, you have to hope you know your number is the exponential of an algebraic number. I forget which Twitter feed brought this to my attention, but here’s a couple geometric theorems demonstrated and explained some by Dave Richeson. There’s something wonderful in a theorem that’s mostly a picture. It feels so supremely mathematical to me. And last, Katherine Bourzac writing for Nature.com reports the creation of a two-dimensional magnet. This delights me since one of the classic problems in statistical mechanics is a thing called the Ising model. It’s a basic model for the mathematics of how magnets would work. The one-dimensional version is simple enough that you can give it to undergrads and have them work through the whole problem. The two-dimensional version is a lot harder to solve and I’m not sure I ever saw it laid out even in grad school. (Mind, I went to grad school for mathematics, not physics, and the subject is a lot more physics.) The four- and higher-dimensional model can be solved by a clever approach called mean field theory. The three-dimensional model .. I don’t think has any exact solution, which seems odd given how that’s the version you’d think was most useful. That there’s a real two-dimensional magnet (well, a one-molecule-thick magnet) doesn’t really affect the model of two-dimensional magnets. The model is interesting enough for its mathematics, which teaches us about all kinds of phase transitions. And it’s close enough to the way certain aspects of real-world magnets behave to enlighten our understanding. The topic couldn’t avoid drawing my eye, is all. Most of the comics I review here are printed on GoComics.com. Well, most of the comics I read online are from there. But even so I think they have more comic strips that mention mathematical themes. Anyway, they’re unleashing a complete web site redesign on Monday. I don’t know just what the final version will look like. I know that the beta versions included the incredibly useful, that is to say dumb, feature where if a particular comic you do read doesn’t have an update for the day — and many of them don’t, as they’re weekly or three-times-a-week or so — then it’ll show some other comic in its place. I mean, the idea of encouraging people to find new comics is a good one. To some extent that’s what I do here. But the beta made no distinction between “comic you don’t read because you never heard of Microcosm ” and “comic you don’t read because glancing at it makes your eyes bleed”. And on an idiosyncratic note, I read a lot of comics. I don’t need to see Dude and Dude reruns in fourteen spots on my daily comics page, even if I didn’t mind it to start. Anyway. I am hoping, desperately hoping, that with the new site all my old links to comics are going to keep working. If they don’t then I suppose I’m just ruined. We’ll see. My suggestion is if you’re at all curious about the comics you read them today (Sunday) just to be safe. Ashleigh Brilliant’s Pot-Shots is a curious little strip I never knew of until GoComics picked it up a few years ago. Its format is compellingly simple: a little illustration alongside a wry, often despairing, caption. I love it, but I also understand why was the subject of endless queries to the Detroit Free Press (Or Whatever) about why was this thing taking up newspaper space. The strip rerun the 31st of December is a typical example of the strip and amuses me at least. And it uses arithmetic as the way to communicate reasoning, both good and bad. Brilliant’s joke does address something that logicians have to face, too. Whether an argument is logically valid depends entirely on its structure. If the form is correct the reasoning may be excellent. But to be sound an argument has to be correct and must also have its assumptions be true. We can separate whether an argument is right from whether it could ever possibly be right. If you don’t see the value in that, you have never participated in an online debate about where James T Kirk was born and whether Spock was the first Vulcan in Star Fleet. Jack Pullan’s Boomerangs rerun for the 2nd is built on the one bit of statistical mechanics that everybody knows, that something or other about entropy always increasing. It’s not a quantum mechanics rule, but it’s a natural confusion. Quantum mechanics has the reputation as the source of all the most solid, irrefutable laws of the universe’s working. Statistical mechanics and thermodynamics have this musty odor of 19th-century steam engines, no matter how much there is to learn from there. Anyway, the collapse of systems into disorder is not an irrevocable thing. It takes only energy or luck to overcome disorderliness. And in many cases we can substitute time for luck. Scott Hilburn’s The Argyle Sweater for the 3rd is the anthropomorphic-geometry-figure joke that’s I’ve been waiting for. I had thought Hilburn did this all the time, although a quick review of Reading the Comics posts suggests he’s been more about anthropomorphic numerals the past year. This is why I log even the boring strips: you never know when I’ll need to check the last time Scott Hilburn used “acute” to mean “cute” in reference to triangles. Mike Thompson’s Grand Avenue uses some arithmetic as the visual cue for “any old kind of schoolwork, really”. Steve Breen’s name seems to have gone entirely from the comic strip. On Usenet group rec.arts.comics.strips Brian Henke found that Breen’s name hasn’t actually been on the comic strip since May, and D D Degg found a July 2014 interview indicating Thompson had mostly taken the strip over from originator Breen. Mark Anderson’s Andertoons for the 5th is another name-drop that doesn’t have any real mathematics content. But come on, we’re talking Andertoons here. If I skipped it the world might end or something untoward like that. Ted Shearer’s Quincy for the 14th of November, 1977, and reprinted the 7th of January, 2017. I kind of remember having a lamp like that. I don’t remember ever sitting down to do my mathematics homework with a paintbrush. Ted Shearer’s Quincy for the 14th of November, 1977, doesn’t have any mathematical content really. Just a mention. But I need some kind of visual appeal for this essay and Shearer is usually good for that. Corey Pandolph, Phil Frank, and Joe Troise’s The Elderberries rerun for the 7th is also a very marginal mention. But, what the heck, it’s got some of your standard wordplay about angles and it’ll get this week’s essay that much closer to 800 words. This essay follows up on distributions, mentioned back on Wednesday. This is only one of the ideas which distributions serve. Do you have a word you’d like to request? I figure to close ‘F’ on Saturday afternoon, and ‘G’ is already taken. But give me a request for a free letter soon and I may be able to work it in. There comes a time a physics major, or a mathematics major paying attention to one of the field’s best non-finance customers, first works on a statistical mechanics problem. Instead of keeping track of the positions and momentums of one or two or four particles she’s given the task of tracking millions of particles. It’s listed as a distribution of all the possible values they can have. But she still knows what it really is. And she looks at how to describe the way this distribution changes in time. If she’s the slightest bit like me, or anyone I knew, she freezes up this. Calculate the development of millions of particles? Impossible! She tries working out what happens to just one, instead, and hopes that gives some useful results. It’s a bit much to call this luck. But it is because the student starts off with some simple problems. Particles of gas in a strong box, typically. They don’t interact chemically. Maybe they bounce off each other, but she’s never asked about that. She’s asked about how they bounce off the walls. She can find the relationship between the volume of the box and the internal gas pressure on the interior and the temperature of the gas. And it comes out right. She goes on to some other problems and it suddenly fails. Eventually she re-reads the descriptions of how to do this sort of problem. And she does them again and again and it doesn’t feel useful. With luck there’s a moment, possibly while showering, that the universe suddenly changes. And the next time the problem works out. She’s working on distributions instead of toy little single-particle problems. But the problem remains: why did it ever work, even for that toy little problem? It’s because some systems of things are ergodic. It’s a property that some physics (or mathematics) problems have. Not all. It’s a bit hard to describe clearly. Part of what motivated me to take this topic is that I want to see if I can explain it clearly. Every part of some system has a set of possible values it might have. A particle of gas can be in any spot inside the box holding it. A person could be in any of the buildings of her city. A pool ball could be travelling in any direction on the pool table. Sometimes that will change. Gas particles move. People go to the store. Pool balls bounce off the edges of the table. These values will have some kind of distribution. Look at where the gas particle is now. And a second from now. And a second after that. And so on, to the limits of human knowledge. Or to when the box breaks open. Maybe the particle will be more often in some areas than in others. Maybe it won’t. Doesn’t matter. It has some distribution. Over time we can say how often we expect to find the gas particle in each of its possible places. The same with whatever our system is. People in buildings. Balls on pool tables. Whatever. Now instead of looking at one particle (person, ball, whatever) we have a lot of them. Millions of particle in the box. Tens of thousands of people in the city. A pool table that somehow supports ten thousand balls. Imagine they’re all settled to wherever they happen to be. So where are they? The gas particle one is easy to imagine. At least for a mathematics major. If you’re stuck on it I’m sorry. I didn’t know. I’ve thought about boxes full of gas particles for decades now and it’s hard to remember that isn’t normal. Let me know if you’re stuck, and where you are. I’d like to know where the conceptual traps are. But back to the gas particles in a box. Some fraction of them are in each possible place in the box. There’s a distribution here of how likely you are to find a particle in each spot. The person in a building is almost certainly not an ergodic system. There’s buildings any one person will never ever go into, however possible it might be. But nearly all buildings have some people who will go into them. The one-person-with-time distribution won’t be the same as the many-people-at-once distribution. Maybe there’s a way to qualify things so that it becomes ergodic. I doubt it. The pool table, now, that’s trickier to say. For a real pool table no, of course not. An actual ball on an actual table rolls to a stop pretty soon, either from the table felt’s friction or because it drops into a pocket. Tens of thousands of balls would form an immobile heap on the table that would be pretty funny to see, now that I think of it. Well, maybe those are the same. But they’re a pretty boring same. And that makes it clear. The one ball on a frictionless, pocketless table bouncing around forever maybe we can imagine. A huge number of balls on that frictionless, pocketless table? Possibly trouble. As long as we’re doing imaginary impossible unplayable pool we could pretend the balls don’t collide with each other. Then the distributions of what ways the balls are moving could be equal. If they do bounce off each other, or if they get so numerous they can’t squeeze past one another, well, that’s different. An ergodic system lets you do this neat, useful trick. You can look at a single example for a long time. Or you can look at a lot of examples at one time. And they’ll agree in their typical behavior. If one is easier to study than the other, good! Use the one that you can work with. Mathematicians like to do this sort of swapping between equivalent problems a lot. The problem is it’s hard to find ergodic systems. We may have a lot of things that look ergodic, that feel like they should be ergodic. But proved ergodic, with a logic that we can’t shake? That’s harder to do. Often in practice we will include a note up top that we are assuming the system to be ergodic. With that “ergodic hypothesis” in mind we carry on with our work. It gives us a handle on a lot of problems that otherwise would be beyond us. Do you ever think about why stuff dissolves? Like, why a spoon of sugar in a glass of water should seem to disappear instead of turning into a slight change in the water’s clarity? Well, sure, in those moods when you look at the world as a child does, not accepting that life is just like that and instead can imagine it being otherwise. Take that sort of question and put it to adult inquiry and you get great science. Peter Mander of the Carnot Cycle blog this month writes a tale about Jacobus Henricus van ‘t Hoff, the first winner of a Nobel Prize for Chemistry. In 1883, on hearing of an interesting experiment with semipermeable membranes, van ‘t Hoff had a brilliant insight about why things go into solution, and how. The insight had only one little problem. It makes for fine reading about the history of chemistry and of its mathematical study. In other, television-related news, the United States edition of The Price Is Right included a mention of “square root day” yesterday, 4/4/16. It was in the game “Cover-Up”, in which the contestant tries making successively better guesses at the price of a car. This they do by covering up wrong digits with new guesses. For the start of the game, before the contestant’s made any guesses, they need something irrelevant to the game to be on the board. So, they put up mock calendar pages for 1/1/2001, 2/2/2004, 3/3/2009, 4/4/2016, and finally a card reading . The game show also had a round devoted to Pi Day a few weeks back. So I suppose they’re trying to reach out to people into pop mathematics. It’s cute. A couple weeks back voting in the Democratic party’s Iowa caucus had several districts tied between Clinton and Sanders supporters. The ties were broken by coin tosses. That fact produced a bunch of jokes at Iowa’s expense. I can’t join in this joking. If the votes don’t support one candidate over another, but someone must win, what’s left but an impartial tie-breaking scheme? After Clinton won six of the coin tosses people joked about the “impartial” idea breaking down. Well, we around here know that there are no unfair coins. And while it’s possible to have an unfair coin toss, I’m not aware of any reason to think any of the tosses were. It’s lucky to win six coin tosses. If the tosses are fair, the chance of getting any one right is one-half. Suppose the tosses are “independent”. That is, the outcome of one doesn’t change the chances of any other. Then the chance of getting six right in a row is the chance of getting one right, times itself, six times over. That is, the chance is one-half raised to the sixth power. That’s a small number, about 1.5 percent. But it’s not so riotously small as to deserve rioting. My love asked me about a claim about this made on a Facebook discussion. The writer asserted that six heads was exactly as likely as any other outcome of six coin tosses. My love wondered: is that true? Yes and no. It depends on what you mean by “any other outcome”. Grant that heads and tails are equally likely to come up. Grant also that coin tosses are independent. Then six heads, H H H H H H, are just as likely to come up as six tails, T T T T T T. I don’t think anyone will argue with me that far. But are both of these exactly as likely as the first toss coming up heads and all the others tails? As likely as H T T T T T? Yes, I would say they are. But I understand if you feel skeptical, and if you want convincing. The chance of getting heads once in a fair coin toss is one-half. We started with that. What’s the chance of getting five tails in a row? That must be one-half raised to the fifth power. The first coin toss and the last five don’t depend on one another. This means the chance of that first heads followed by those five tails is one-half times one-half to the fifth power. And that’s one-half to the sixth power. What about the first two tosses coming up heads and the next four tails? H H T T T T? We can run through the argument again. The chance of two coin tosses coming up heads would be one-half to the second power. The chance of four coin tosses coming up tails would be one-half to the fourth power. The chance of the first streak being followed by the second is the product of the two chances. One-half to the second power times one-half to the fourth power is one-half to the sixth power. We could go on like this and try out all the possible outcomes. There’s only 64 of them. That’s going to be boring. We could prove any particular string of outcomes is just as likely as any other. We need to make an argument that’s a little more clever, but also a little more abstract. Don’t think just now of a particular sequence of coin toss outcomes. Consider this instead: what is the chance you will call a coin toss right? You might call heads, you might call tails. The coin might come up heads, the coin might come up tails. The chance you call it right, though — well, won’t that be one-half? Stay at this point until you’re sure it is. So write out a sequence of possible outcomes. Don’t tell me what it is. It can be any set of H and T, as you like, as long as it’s six outcomes long. What is the chance you wrote down six correct tosses in a row? That’ll be the chance of calling one outcome right, one-half, times itself six times over. One-half to the sixth power. So I know the probability that your prediction was correct. Which of the 64 possible outcomes did you write down? I don’t know. I suspect you didn’t even write one down. I would’ve just pretended I had one in mind until the essay required me to do something too. But the exact same argument applies no matter which sequence you pretended to write down. (Look at it. I didn’t use any information about what sequence you would have picked. So how could the sequence affect the outcome?) Therefore each of the 64 possible outcomes has the same chance of coming up. So in this context, yes, six heads in a row is exactly as likely as any other sequence of six coin tosses. I will guess that you aren’t perfectly happy with this argument. It probably feels like something is unaccounted-for. What’s unaccounted-for is that nobody cares about the difference between the sequence H H T H H H and the sequence H H H T H H. Would you even notice the difference if I hadn’t framed the paragraph to make the difference stand out? In either case, the sequence is “one tail, five heads”. What’s the chance of getting “one tail, five heads”? Well, the chance of getting one of several mutually exclusive outcomes is the sum of the chance of each individual outcome. And these are mutually exclusive outcomes: you can’t get both H H T H H H and H H H T H H as the result of the same set of coin tosses. There are six distinct ways to get one tails and five heads. The tails can be the first toss’s result. Or the tails can be the second toss’s result. Or the tails can be the third toss’s result. And so on. Each of these possible outcomes has the same probability, one-half to the sixth power. So the chance of getting “one tails, five heads” is one-half to the sixth power, added to itself, six times over. That is, it’s six times one-half to the sixth power. That will come up about one time in eleven that you do a sequence of six coin tosses. There are fifteen ways to get two tails and four heads. So the chance of the outcome being “two tails, four heads” is fifteen times one-half to the sixth power. That will come up a bit less than one in four times. There are twenty, count ’em, ways to get three tails and three heads. So the chance of that is twenty times one-half to the sixth power. That’s a little more than three times in ten. There are fifteen ways to get four tails and two heads, so the chance of that drops again. There’s six ways to get five tails and one heads. And there’s just one way to get six tails and no heads on six coin tosses. So if you think of the outcome as “this many tails and that many heads”, then, no, not all outcomes are equally likely. “Three tails and three heads” is a lot more likely than “no tails and six heads”. “Two tails and four heads” is more likely than “one tails and five heads”. Whether it’s right to say “every outcome is just as likely” depends on what you think “an outcome” is. If it’s a particular sequence of heads and tails, then yes, it is. If it’s the aggregate statistic of how many heads and tails, then no, it’s not. The distinction carries over into statistical mechanics. The field studies the state of things. Is a mass of material solid or liquid or gas? Is a solid magnetized or not, or is it trying to be? Are molecules in a high- or a low-energy state? Mathematicians use the name “ensemble” to describe a state of whatever it is we’re studying. But we have the same problem of saying what kind of description we mean. Suppose we are studying the magnetism of a solid object. We do this by imagining the object as a bunch of smaller regions, each with a tiny bit of magnetism. That bit might have the north pole pointing up, or the south pole pointing up. We might say the ensemble is that there are ten percent more north-pole-up regions than there are south-pole-up regions. But by that, do we mean we’re interested in “ten percent more north-pole-up than south-pole-up regions”? Or do we mean “these particular regions are north-pole-up, and these are south-pole-up”? We distinguish this by putting in some new words. The “canonical ensemble” is, generally, the kind of aggregate-statistical-average description of things. So, “ten percent more north-pole-up than south-pole-up regions” would be such a canonical ensemble. Or “one tails, five heads” would be a canonical ensemble. If we want to look at the fine details we speak of the “microcanonical ensemble”. That would be “these particular regions are north-pole-up, and these are south-pole-up”. Or that would be “the coin tosses came up H H H T H H”. Just what is a canonical and what is a microcanonical ensemble depends on context. Of course it would. Consider the standpoint of the city manager, hoping to estimate the power and water needs of neighborhoods and bringing the language of statistical mechanics to the city-planning world. There, it is enough detail to know how many houses on a particular street are occupied and how many residents there are. She could fairly consider that a microcanonical ensemble. From the standpoint of the letter carriers for the post office, though, that would be a canonical ensemble. It would give an idea how much time would be needed to deliver on that street. But would be just short of useful in getting letters to recipients. The letter carrier would want to know which people are in which house before rating that a microcanonical ensemble. Much of statistical mechanics is studying ensembles, and which ensembles are more or less likely than others. And how that likelihood changes as conditions change. So let me answer the original question. In this coin-toss problem, yes, every microcanonical ensemble is just as likely as every other microcanonical ensemble. The sequence ‘H H H H H H’ is just as likely as ‘H T H H H T’ or ‘T T H T H H’ are. But not every canonical ensemble is as likely as every other one. Six heads in six tosses are less likely than two heads and four tails, or three heads and three tails, are. The answer depends on what you mean by the question. I couldn’t go on calling this Back To School Editions. A couple of the comic strips the past week have given me reason to mention people famous in mathematics or physics circles, and one who’s even famous in the real world too. That’ll do for a title. Jeff Corriveau’s Deflocked for the 15th of September tells what I want to call an old joke about geese formations. The thing is that I’m not sure it is an old joke. At least I can’t think of it being done much. It seems like it should have been. The formations that geese, or other birds, form has been a neat corner of mathematics. The question they inspire is “how do birds know what to do?” How can they form complicated groupings and, more, change their flight patterns at a moment’s notice? (Geese flying in V shapes don’t need to do that, but other flocking birds will.) One surprising answer is that if each bird is just trying to follow a couple of simple rules, then if you have enough birds, the group will do amazingly complex things. This is good for people who want to say how complex things come about. It suggests you don’t need very much to have robust and flexible systems. It’s also bad for people who want to say how complex things come about. It suggests that many things that would be interesting can’t be studied in simpler models. Use a smaller number of birds or fewer rules or such and the interesting behavior doesn’t appear. Jeff Corriveau’s Deflocked for the 15th of September, 2015. Scott Adams’s Dilbert Classics from the 15th and 16th of September (originally run the 22nd and 23rd of July, 1992) are about mathematical forecasts of the future. This is a hard field. It’s one people have been dreaming of doing for a long while. J Willard Gibbs, the renowned 19th century physicist who put the mathematics of thermodynamics in essentially its modern form, pondered whether a thermodynamics of history could be made. But attempts at making such predictions top out at demographic or rough economic forecasts, and for obvious reason. Maria Scrivan’s Half Full for the 16th of September makes the Common Core joke. A generation ago this was a New Math joke. It’s got me curious about the history of attempts to reform mathematics teaching, and how poorly they get received. Surely someone’s written a popular or at least semipopular book about the process? I need some friends in the anthropology or sociology departments to tell, I suppose. Mell Lazarus’s Momma for the 16th of September sneers at the idea of predicting where specks of dust will land. But the motion of dust particles is interesting. What can be said about the way dust moves when the dust is being battered by air molecules that are moving as good as randomly? This becomes a problem in statistical mechanics, and one that depends on many things, including just how fast air particles move and how big molecules are. Now for the celebrity part of this story. Albert Einstein published four papers in his “Annus mirabilis” year of 1905. One of them was the Special Theory of Relativity, and another the mass-energy equivalence. Those, and the General Theory of Relativity, are surely why he became and still is a familiar name to people. One of his others was on the photoelectric effect. It’s a cornerstone of quantum mechanics. If Einstein had done nothing in relativity he’d still be renowned among physicists for that. The last paper, though, that was on Brownian motion, the movement of particles buffeted by random forces like this. And if he’d done nothing in relativity or quantum mechanics, he’d still probably be known in statistical mechanics circles for this work. Among other things this work gave the first good estimates for the size of atoms and molecules, and gave easily observable, macroscopic-scale evidence that molecules must exist. That took some work, though. Dave Whamond’s Reality Check for the 16th of September shows off the Metropolitan Museum of Symmetry. This is probably meant to be an art museum. Symmetries are studied in mathematics too, though. Many symmetries, the ways you can swap shapes around, form interesting groups or rings. And in mathematical physics, symmetries give us useful information about the behavior of systems. That’s enough for me to claim this comic is mathematically linked. My love and I play in several pinball leagues. I need to explain something of how they work. Most of them organize league nights by making groups of three or four players and having them play five games each on a variety of pinball tables. The groupings are made by order. The 1st through 4th highest-ranked players who’re present are the first group, the 5th through 8th the second group, the 9th through 12th the third group, and so on. For each table the player with the highest score gets some number of league points. The second-highest score earns a lesser number of league points, third-highest gets fewer points yet, and the lowest score earns the player comments about how the table was not being fair. The total number of points goes into the player’s season score, which gives her ranking. You might see the bootstrapping problem here. Where do the rankings come from? And what happens if someone joins the league mid-season? What if someone misses a competition day? (Some leagues give a fraction of points based on the player’s season average. Other leagues award no points.) How does a player get correctly ranked? I said yesterday I was padding one mathematics-comics post into two for silly reasons. And I was. But there were enough Sunday comics on point that splitting one entry into two has turned out to be legitimate. Nice how that works out sometimes. Mason Mastroianni, Mick Mastroianni, and Perri Hart’s B.C. (June 19) uses mathematics as something to heap upon a person until they yield to your argument. It’s a fallacious way to argue, but it does work. Even at a mathematical conference the terror produced by a screen full of symbols can chase follow-up questions away. On the 21st, they present mathematics as a more obviously useful thing. Well, mathematics with a bit of physics. Nate Frakes’s Break Of Day (June 19) is this week’s anthropomorphic algebra joke. Niklas Eriksson’s Carpe Diem for the 20th of June, 2015. Niklas Eriksson’s Carpe Diem (June 20) is captioned “Life at the Quantum Level”. And it’s built on the idea that quantum particles could be in multiple places at once. Whether something can be in two places at once depends on coming up with a clear idea about what you mean by “thing” and “places” and for that matter “at once”; when you try to pin the ideas down they prove to be slippery. But the mathematics of quantum mechanics is fascinating. It cries out for treating things we would like to know about, such as positions and momentums and energies of particles, as distributions instead of fixed values. That is, we know how likely it is a particle is in some region of space compared to how likely it is somewhere else. In statistical mechanics we resort to this because we want to study so many particles, or so many interactions, that it’s impractical to keep track of them all. In quantum mechanics we need to resort to this because it appears this is just how the world works. Brian and Ron Boychuk’s Chuckle Brothers (June 20) name-drops algebra as the kind of mathematics kids still living with their parents have trouble with. That’s probably required by the desire to make a joking definition of “aftermath”, so that some specific subject has to be named. And it needs parents to still be watching closely over their kids, something that doesn’t quite fit for college-level classes like Intro to Differential Equations. So algebra, geometry, or trigonometry it must be. I am curious whether algebra reads as the funniest of that set of words, or if it just fits better in the space available. ‘Geometry’ is as long a word as ‘algebra’, but it may not have the same connotation of being an impossibly hard class. Jimmy Hatlo’s Little Iodine for the 18th of April, 1954, and rerun the 18th of June, 2015. And from the world of vintage comic strips, Jimmy Hatlo’s Little Iodine (June 21, originally run the 18th of April, 1954) reminds us that anybody can do any amount of arithmetic if it’s something they really want to calculate. Jeffrey Caulfield and Alexandre Rouillard’s Mustard and Boloney (June 21) is another strip using the idea of mathematics — and particularly word problems — to signify great intelligence. I suppose it’s easier to recognize the form of a word problem than it is to recognize a good paper on the humanities if you only have two dozen words to show it in. Juba’s Viivi and Wagner (June 21) is a timely reminder that while sudokus may be fun logic puzzles, they are ultimately the puzzle you decide to make of them. This month Peter Mander’s CarnotCycle blog talks about the interesting world of statistical equilibriums. And particularly it talks about stable equilibriums. A system’s in equilibrium if it isn’t going to change over time. It’s in a stable equilibrium if being pushed a little bit out of equilibrium isn’t going to make the system unpredictable. For simple physical problems these are easy to understand. For example, a marble resting at the bottom of a spherical bowl is in a stable equilibrium. At the exact bottom of the bowl, the marble won’t roll away. If you give the marble a little nudge, it’ll roll around, but it’ll stay near where it started. A marble sitting on the top of a sphere is in an equilibrium — if it’s perfectly balanced it’ll stay where it is — but it’s not a stable one. Give the marble a nudge and it’ll roll away, never to come back. In statistical mechanics we look at complicated physical systems, ones with thousands or millions or even really huge numbers of particles interacting. But there are still equilibriums, some stable, some not. In these, stuff will still happen, but the kind of behavior doesn’t change. Think of a steadily-flowing river: none of the water is staying still, or close to it, but the river isn’t changing. CarnotCycle describes how to tell, from properties like temperature and pressure and entropy, when systems are in a stable equilibrium. These are properties that don’t tell us a lot about what any particular particle is doing, but they can describe the whole system well. The essay is higher-level than usual for my blog. But if you’re taking a statistical mechanics or thermodynamics course this is just the sort of essay you’ll find useful. In terms of simplicity, purely mechanical systems have an advantage over thermodynamic systems in that stability and instability can be defined solely in terms of potential energy. 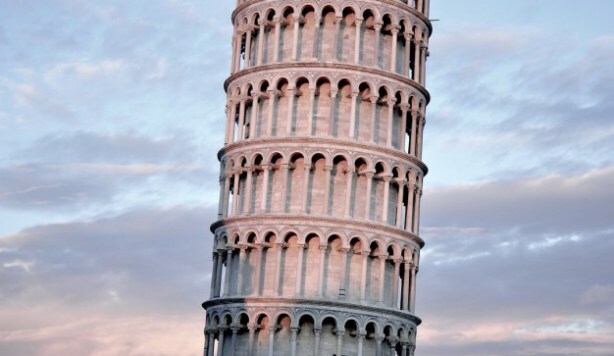 For example the center of mass of the tower at Pisa, in its present state, must be higher than in some infinitely near positions, so we can conclude that the structure is not in stable equilibrium. This will only be the case if the tower attains the condition of metastability by returning to a vertical position or absolute stability by exceeding the tipping point and falling over. Thermodynamic systems lack this simplicity, but in common with purely mechanical systems, thermodynamic equilibria are always metastable or stable, and never unstable. This is equivalent to saying that every spontaneous (observable) process proceeds towards an equilibrium state, never away from it. I had been talking about how much information there is in the outcome of basketball games, or tournaments, or the like. I wanted to fill in at least one technical term, to match some of the others I’d given. In this information-theory context, an experiment is just anything that could have different outcomes. A team can win or can lose or can tie in a game; that makes the game an experiment. The outcomes are the team wins, or loses, or ties. A team can get a particular score in the game; that makes that game a different experiment. The possible outcomes are the team scores zero points, or one point, or two points, or so on up to whatever the greatest possible score is. The sigma summation symbol means to evaluate the expression to the right of it for every value of some index j. The pj means the probability of outcome number j. And the logarithm may be that of any base, although if we use base two then we have an information content measured in bits. Those are the same bits as are in the bytes that make up the megabytes and gigabytes in your computer. You can see this number as an estimate of how many well-chosen yes-or-no questions you’d have to ask to pick the actual result out of all the possible ones. I’d called this the information content of the experiment’s outcome. That’s an idiosyncratic term, chosen because I wanted to hide what it’s normally called. The normal name for this is the “entropy”. To be more precise, it’s known as the “Shannon entropy”, after Claude Shannon, pioneer of the modern theory of information. However, the equation defining it looks the same as one that defines the entropy of statistical mechanics, that thing everyone knows is always increasing and somehow connected with stuff breaking down. Well, almost the same. The statistical mechanics one multiplies the sum by a constant number called the Boltzmann constant, after Ludwig Boltzmann, who did so much to put statistical mechanics in its present and very useful form. We aren’t thrown by that. The statistical mechanics entropy describes energy that is in a system but that can’t be used. It’s almost background noise, present but nothing of interest. Is this Shannon entropy the same entropy as in statistical mechanics? This gets into some abstract grounds. If two things are described by the same formula, are they the same kind of thing? Maybe they are, although it’s hard to see what kind of thing might be shared by “how interesting the score of a basketball game is” and “how much unavailable energy there is in an engine”. The legend has it that when Shannon was working out his information theory he needed a name for this quantity. John von Neumann, the mathematician and pioneer of computer science, suggested, “You should call it entropy. In the first place, a mathematical development very much like yours already exists in Boltzmann’s statistical mechanics, and in the second place, no one understands entropy very well, so in any discussion you will be in a position of advantage.” There are variations of the quote, but they have the same structure and punch line. The anecdote appears to trace back to an April 1961 seminar at MIT given by one Myron Tribus, who claimed to have heard the story from Shannon. I am not sure whether it is literally true, but it does express a feeling about how people understand entropy that is true. I’m not comfortable saying they’re the same thing, though. After all, we use the same formula to calculate a batting average and to work out the average time of a commute. But we don’t think those are the same thing, at least not more generally than “they’re both averages”. These entropies measure different kinds of things. They have different units that just can’t be sensibly converted from one to another. And the statistical mechanics entropy has many definitions that not just don’t have parallels for information, but wouldn’t even make sense for information. I would call these entropies siblings, with strikingly similar profiles, but not more than that. But let me point out something about the Shannon entropy. It is low when an outcome is predictable. If the outcome is unpredictable, presumably knowing the outcome will be interesting, because there is no guessing what it might be. This is where the entropy is maximized. But an absolutely random outcome also has a high entropy. And that’s boring. There’s no reason for the outcome to be one option instead of another. Somehow, as looked at by the measure of entropy, the most interesting of outcomes and the most meaningless of outcomes blur together. There is something wondrous and strange in that. Peter Mander of the Carnot Cycle blog, which is primarily about thermodynamics, has a neat bit about constructing a mathematical model for how the body works. This model doesn’t look anything like a real body, as it’s concerned with basically the flow of heat, and how respiration fires the work our bodies need to do to live. Modeling at this sort of detail brings to mind an old joke told of mathematicians — that, challenged to design a maximally efficient dairy farm, the mathematician begins with “assume a spherical cow” — but great insights can come from models that look too simple to work. It also, sad to say, includes a bit of Bright Young Science-Minded Lad (in this case, the author’s partner of the time) reasoning his way through what traumatized people might think, in a way that’s surely well-intended but also has to be described as “surely well-intended”, so, know that the tags up top of the article aren’t misleading. I should mention — I should have mentioned earlier, but it has been a busy week — that CarnotCycle has published the second part of “The Geometry of Thermodynamics”. This is a bit of a tougher read than the first part, admittedly, but it’s still worth reading. 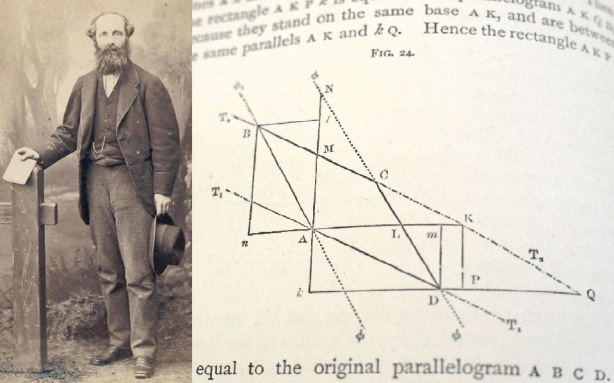 The essay reviews how James Clerk Maxwell — yes, that Maxwell — developed the thermodynamic relationships that would have made him famous in physics if it weren’t for his work in electromagnetism that ultimately overthrew the Newtonian paradigm of space and time. The ingenious thing is that the best part of this work is done on geometric grounds, on thinking of the spatial relationships between quantities that describe how a system moves heat around. “Spatial” may seem a strange word to describe this since we’re talking about things that don’t have any direct physical presence, like “temperature” and “entropy”. But if you draw pictures of how these quantities relate to one another, you have curves and parallelograms and figures that follow the same rules of how things fit together that you’re used to from ordinary everyday objects. A wonderful side point is a touch of human fallibility from a great mind: in working out his relations, Maxwell misunderstood just what was meant by “entropy”, and needed correction by the at-least-as-great Josiah Willard Gibbs. Many people don’t quite know what to make of entropy even today, and Maxwell was working when the word was barely a generation away from being coined, so it’s quite reasonable he might not understand a term that was relatively new and still getting its precise definition. It’s surprising nevertheless to see. Every student of thermodynamics sooner or later encounters the Maxwell relations – an extremely useful set of statements of equality among partial derivatives, principally involving the state variables P, V, T and S. They are general thermodynamic relations valid for all systems.